The zebra longwing, Heliconius charitonius, is in the Nymphalidae, or brush footed, family and the subfamily of Heliconiiae. Helicaonian butterflies in Florida include the gulf fritillary, zebra longwing, and the julia. The julia is more of a southern Florida butterfly and only rarely seen in central Florida. Zebra longwings are black and banded with narrow yellow stripes. The bases of wings have red spots. It is usually found floating lazily through woodlands & woodland edges in search of nectar & its host plants. Its host plants, Passiflora lutea & Passiflora suberosa prefer the part shade of woodlands & woodland edges. At night they roost in shrubbery with a large number gathering in the same location. They are thought to be one of the most intelligent butterflies. Newly emerged butterflies readily learn locations of nectar sources and communal roosting sites from older adults. There life span ranges from four to six months. They are also one of only a few butterflies that are able to use pollen as food source. Some of their preferred nectar plants are Spanish needle (Bidens pilosa), red salvia (Salvia coccinea), blue porterweed (Stachytarpheta jamaicensis), golden dewdrop (Duranta repens) & firebush (Hamelia patens). You can buy firebush starter plants here and firebush seeds here. Zebras lay their eggs on passion vines. They prefer yellow passionflower (Passiflora lutea) and corkystem passionflower (Passiflora suberosa) because both of these species generally grow in part shade. Zebra longwing butterflies avoid full sun, when nectaring, and laying eggs because their black coloration absorbs a great deal of heat. 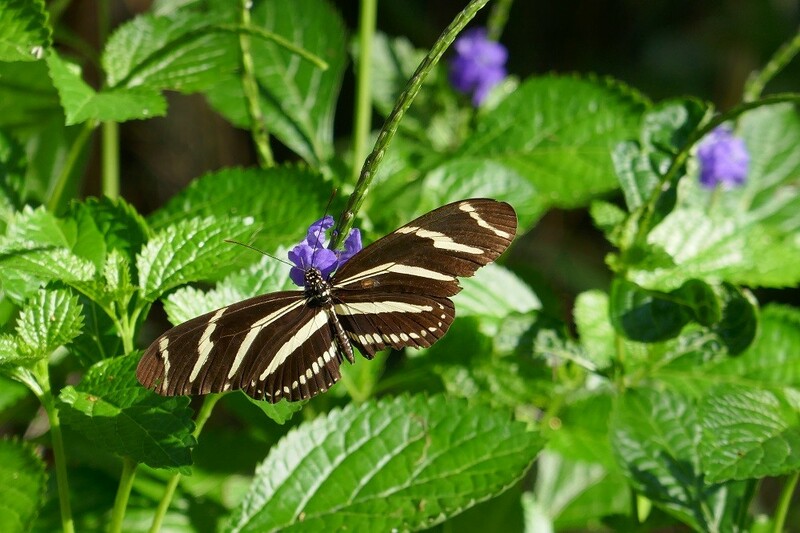 If your butterfly garden only contains purple passionflower (Passiflora incarnata) you may not see many zebra longwings since they prefer shade and the shade loving species of passionflower. The eggs are pale yellow and become darker with age. They are laid singly on the new leaf tips or new tendrils. 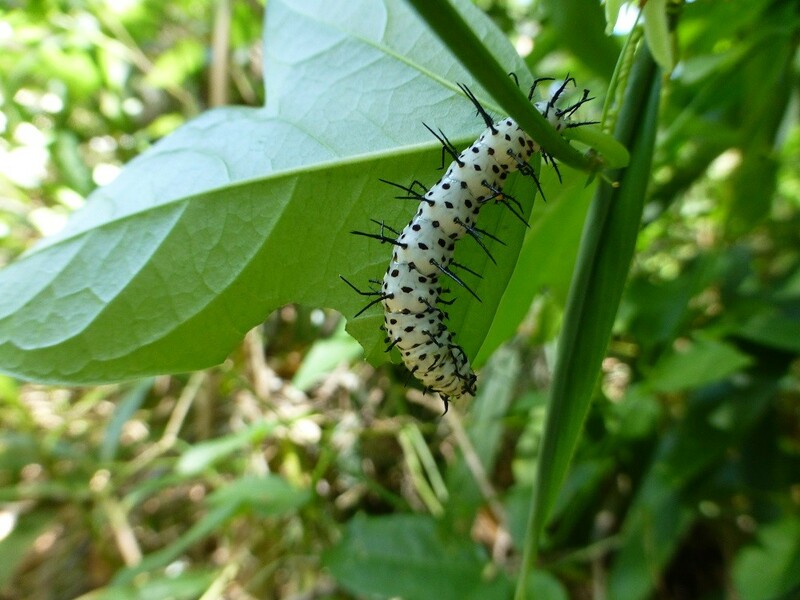 The larva, or caterpillar, is white with rows of branching black spines, which are stingless. 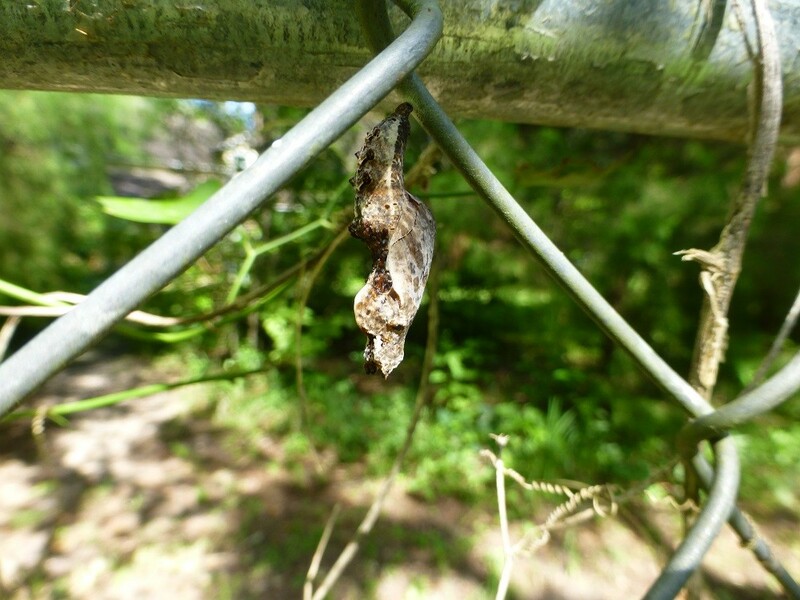 The chrysalis is spiny and mottled brown with metallic spots on the side. You can purchase corkystem passionflower starter plants here.